This begins writer Catherine Brown’s 1933 description of a gypsy wedding. The zurla or surla of Macedonia and southern Serbia is another in a series of wonderfully harsh-sounding double-reed shawms (types of oboes) that I can feature on the site. The zurla is closely related to the zurna of Turkey as well as the mizmar of Egypt, and is also related to the Indian shehnai, among other oboe-like folk instruments. And like many of those instruments, it is historically meant to be played outdoors at festivals and celebrations, very often for dancing. It’s immediately apparent why. The piercing, nasal quality of the zurla at close range can’t be underestimated, and this particular duo of zurle players take their performance to the next level, almost approaching sounds equivalent to harsh, free jazz noise. Zurle come in small and large sizes – about 14 and 25 inches long, respectively. There is a small, thread-wound disc called a mendik that presses against the player’s lips, and which helps with tuning (or circular breathing, depending on who you ask). The reed is made from a kind of grass known as trska. The zurla is usually played in pairs, with one player holding down a drone, and the other playing the melody. They are accompanied by at least one musician on the tapan (more or less the same as the tupan, which accompanies the zurna in Turkey), the double-headed drum that’s worn around the chest. 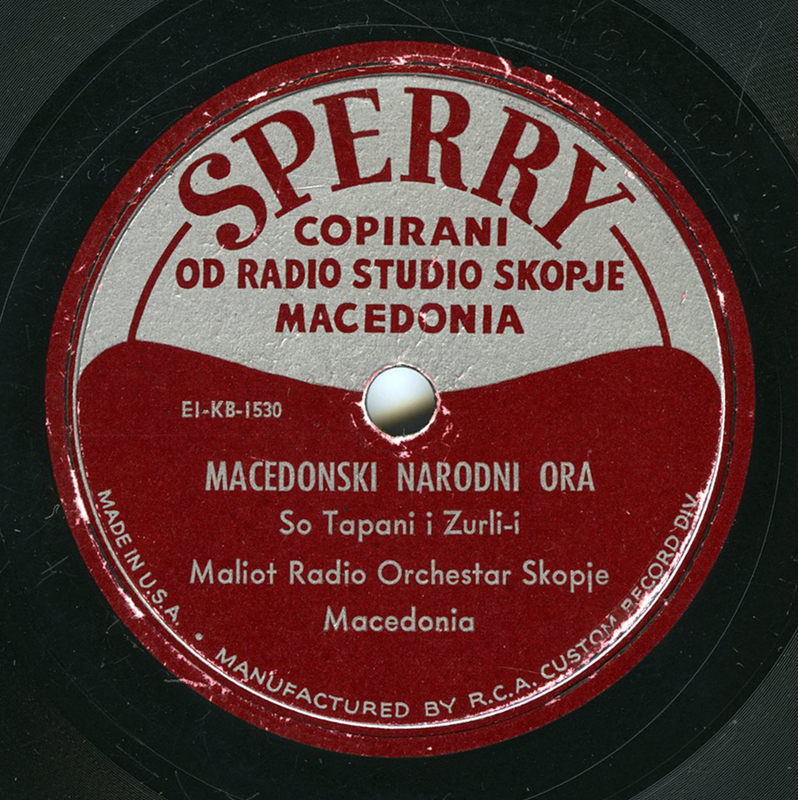 The Sperry label, based at 10625 Shoemaker Street in Detroit, Michigan, was run by Sperry Boge and issued a number of recordings originating from tape, and all from Macedonian groups sponsored by Radio Skopje. Radio Skopje began broadcasting in 1944. I know very little information on Sperry, however, they were in operation for a number of years in the early 1950s, issuing approximately 120 selections on 78 and 33rpm. All of their records were RCA Custom pressings. RCA had three custom pressing plants in the United States including one located in Indianapolis, Indiana, and the pressing number on this disc indicates that this Sperry record was pressed in 1951 – though finding an actual recording date might be more difficult. Thanks to Joel Ackerman and Larry Weiner for additional info. Lovely to see this – noticed a small mistake, the number shown on the label is: EI-KB-1530 (not 1350, as you have). I’d love to correspond with you in more detail about your site, which is very impressive (I’ve just met it). Thank you for that! Fixed. Sure, feel free – my contact e-mail is on the “About” page.